The latest issue of the Automotive News Europe monthly magazine goes live on Monday, May 1. 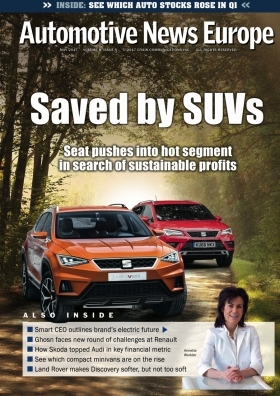 The new edition looks at how Seat ended more than a decade of losses and why it expects to become a reliable moneymaker for parent VW Group. The turn around happened thanks in part to its successful entry into SUV/crossovers, one of the hottest segments in Europe. Now Volkswagen Group’s once-ailing Spanish brand is counting on an even heavier dosage of SUVs -- two more launches in the next two years -- to become a reliable profit machine after 11 consecutive years of financial losses put the brand’s future in doubt. Seat Chairman Luca de Meo is feeling bullish about his SUV-driven strategy because of strong demand for the automaker’s first-ever crossover, the Ateca, which finished 2016 as Europe’s 14th ranked compact SUV despite only being available for about half the year. Growing to three SUVs from zero will expand Seat’s coverage of the European market to 72 percent from 53 percent, something that de Meo knows Seat will need to help the brand reach his long-term operating margin goal of 1.5 percent to 4.4 percent. Our cover story analyzes Seat’s strengths and weakness. Meanwhile, in an interview with de Meo the Seat boss outlined the brand’s future role within the VW Group and explained why Czech sister brand Skoda is so much further ahead in its development. Speaking of Skoda, we tell you about the special gift it delivered to its parent on the brand’s 25th anniversary as a subsidiary of the VW Group. Daimler’s Mercedes-Benz regained global premium-car leadership last year by outselling BMW for the first time since 2005, a feat it wouldn’t have achieved without all its factories running at full capacity. Production chief Markus Schaefer explained what he’s doing to make sure Mercedes’ global output keeps pace with record demand. Another Daimler subsidiary, Smart, had its best year ever in 2016. Annette Winkler, who leads the small-car brand, shared how she plans to take Smart to the next level. For an executive such as Carlos Ghosn, who thrives on challenges, the automotive industry has provided a never-ending “to-do” list. After relinquishing his CEO role at Nissan to focus on the two companies’ alliance and the integration of Mitsubishi, Ghosn is now fully involved in a new five-year plan that, for the first time, will comprise all the alliance brands, including Russian subsidiary AvtoVAZ. We review what lies ahead for the 63-year-old executive, who has shown no signs that he plans to retire anytime soon. Europe’s compact minivan segment is forecast to continually decline until 2020 because of rising demand for SUVs and crossovers. At the same time, models such as the BMW 2-series Active Tourer and Gran Tourer show there is a growing interest in utility vehicles from premium brands. Honda’s latest Civic benefited from the largest development program for a single model in the company’s history. The five-door hatchback is the sportiest Civic to date with significant upgrades to its driving dynamics, interior quality, safety and fuel efficiency. At the same time, despite the uncertainties connected to Brexit, the new model will be produced only in Swindon, England, and exported globally, while its predecessor was built in nine factories on four continents. Land Rover is determined to demonstrate that even though the fifth generation of the Discovery is more luxurious than its predecessor, it remains true to the SUV brand’s go-anywhere philosophy. A car’s human-machine interface used to be all about giving the driver basic information. The rapid move toward autonomous driving, however, is changing the rules. Continental systems and technologies boss Karsten Michels explained how HMI systems will need to swiftly and seamlessly handle the volumes of information generated by self-driving cars to build up trust with the driver. Macedonia has spent the last decade establishing itself as open for business to global automotive suppliers because of its availability of skilled, low-cost labor, proximity to key European markets and its willingness to provide generous incentives. Our Final Word column looks at the challenges the small country, which used to be part of Yugoslavia, faces if it wants to convince an automaker to open a vehicle assembly plant there. Shareholder value growth slowed considerably for automakers in the first three months of 2017 but improved for partsmakers and car retailers. Automakers grew just 2.3 percent, compared with gains of 11 percent in Q3 and 15 percent in Q4 of last year. The slow growth came despite a 22 percent gain in shareholder value for PSA Group. Meanwhile, suppliers increased their shareholder value 12.5 percent in Q1 and retailers were up 13 percent. See which companies led the way in the first three months.